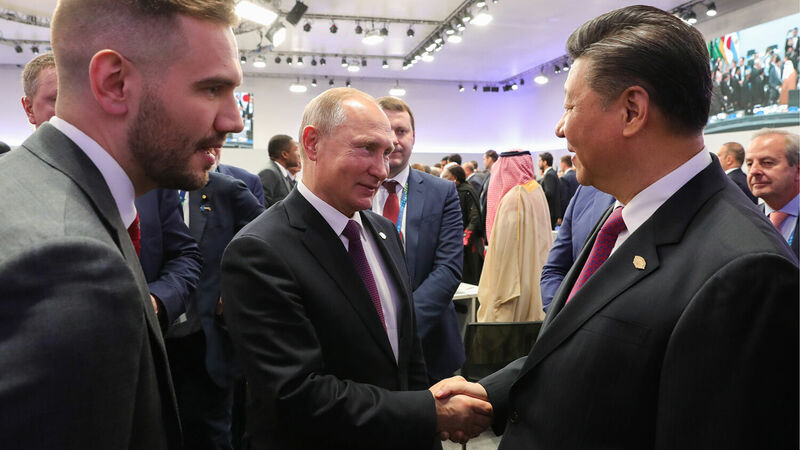 Russian President Vladimir Putin greets Chinese President Xi Jinping on the sidelines of the 2018 G-20 Leaders’ Summit. The partnership between Moscow and Beijing was foretold 2,500 years ago. Now it is becoming a reality. The new year is shaping up to be a momentous one for cooperation between Russia and China, as the two Asian giants work to form ever-deeper bonds across a wide range of areas. The first major sign of deepening cooperation came on January 9 when Russia’s central bank said it dumped around $101 billion in United States holdings last spring and picked up about $44 billion in Chinese yuan. Russia acquired the remaining amount in euros and the Japanese yen, according to a report published by the Bank of Russia, which discloses information with a six-month lag. The shift, largely in response to U.S. sanctions imposed on Russia last spring, means Chinese yuan now account for 15 percent of Russia’s huge reserves. The move also means Russia now owns roughly a quarter of global reserves held in yuan, which is around 10 times more than any other nation. In November, Russian President Vladimir Putin said, “We aren’t ditching the dollar, the dollar is ditching us.” He spoke about the instability of dollar payments in nations like Russia due to the constant threat of U.S. sanctions. The central bank’s new report shows that Russia is diversifying away from the dollar and toward the yuan in a significant way. Meanwhile, on January 10, Russian nuclear energy firm Rosatom announced that it would help construct China’s new cfr-600 fast-neutron reactor and would also supply its nuclear fuel. After six months of negotiations, the two sides signed a contract that covers “the initial loading of nuclear fuel, as well as supplies for refueling during the first seven years of the reactor operation,” the report stated. The contract is part of a large-scale program of Russia-China cooperation in the nuclear sector that aims to foster decades of deals. These three developments are only the latest in 15 years of rapidly deepening Russia-China ties. Relations between Russia and China didn’t begin to thaw until the end of the Cold War. But today, the two are close partners. Since 2003, they have held 30 joint military exercises. China has become Russia’s weapons industry’s biggest and most reliable customer, and a close personal relationship continues to deepen between Putin and Chinese leader Xi Jinping. The Trumpet monitors and reports on strengthening Russia-China ties because Bible prophecy foretells of an Asian power bloc that will be formed in the end time, referred to in Revelation 16:12 as “the kings of the east.” The Scriptures show that this Asian bloc will play a major role in a nuclear World War iii. Actually we have been proclaiming for over 50 years that Russia, China and other Asian nations would ally themselves in the end time. And we are in that end time now. … When these Asian nations—extremely powerful nuclear-armed countries—begin to show solidarity with each other regarding moves like that, what does that portend for the world? I tell you it is woe to the world. It will cause many serious problems. To understand more about the numerous Bible passages that discuss this Asian confederation and its role in end-time events, order your free copy of Russia and China in Prophecy.